As the symbolists, constructivists and surrealists of the historical avant-garde began to abandon traditional theatre spaces and embrace the more contingent locations of the theatrical and political ‘event’, the built environment of a performance became not only part of the event, but an event in and of itself. Event-Space radically re-evaluates the avant garde’s championing of nonrepresentational spaces, drawing on the specific fields of performance studies and architectural studies to establish a theory of ‘performative architecture’. ‘Event’ was of immense significance to modernism’s revolutionary agenda, resisting realism and naturalism – and, simultaneously, the monumentality of architecture itself. 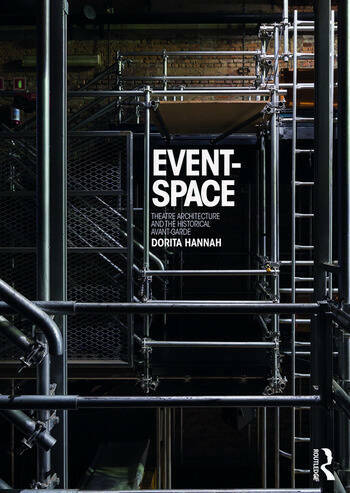 Event-Space analyzes a number of spatiotemporal models central to that revolution, both illuminating the history of avant-garde performance and inspiring contemporary approaches to performance space. "Our provisional theatre at Bayreuth"
Symbolist "Theatre of the Mind"
City as a "Montage of Attractions"
Total Theatre: The "Great Stage Machine"
Dorita Hannah works across the spatial, visual and performing arts as a scholar and design practitioner specializing in theatre architecture and performance design. She is a Professor affiliated with the University of Auckland (New Zealand), University of Tasmania (Australia) and Aalto University (Finland).